3 Needle bind off is done on Erin but not without a few rips and reknits. The photo shows the shoulder seam and how the Chart C does not line up. The front and back are not reverse images so no way they would ever meet up. I decided to do a few rows of Chart B at the shoulder. It is such a simple pattern it lines up. Kept dropping stitches during the 3 needle bind off which is why there are still safety pins on two stitches to go back and pick up - again. Neck stitches are picked up and ready to go for the neck ribbing. 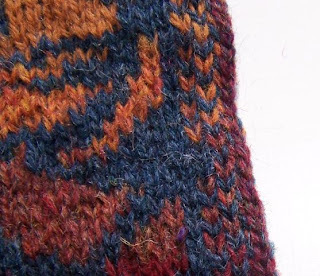 The closeup photo shows how even the edge is when you crochet the steek. It takes a long time to do the crochet but, to me, it is worth it. 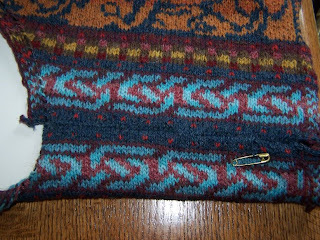 The steek will be folded under when the edge stitch is picked up to be knit for the buttonhole band. You are getting close! What a gorgeous sweater. Your Erin is wonderful. I did leave a comment but it didn't show up so I will try again. I love your creatures. You did a wonderful jog. I want one too. You are a really great knitter my friend.